The immediate area boasts some spectacular countryside and is a haven for wildlife yet is also conveniently situated just a short drive from Bath designated UNESCO World Heritage site and where you can visit the world famous Roman Baths. Even closer to home the city of Bristol boasts an array of shops and restaurants along with European Green Capital Status. Outdoors enthusiasts are also well-catered for as keen walkers can enjoy the Mendip Hills and spectacular Cheddar Gorge Britain s biggest gorge with dramatic cliffs rising 450ft to the stunning stalactite caverns. Fishing is also available at Blagdon and Chew lakes. Other attractions and places of interest nearby include Glastonbury Abbey and Tor and numerous National Trust properties. The property is approached by a short flight of steps down from the private parking area. Upon entering you will immediately find yourself in a light and bright hallway with a beautifully presented shower room with shower and WC to the side. This then leads through to the stunning open-plan lounge/kitchen/diner . 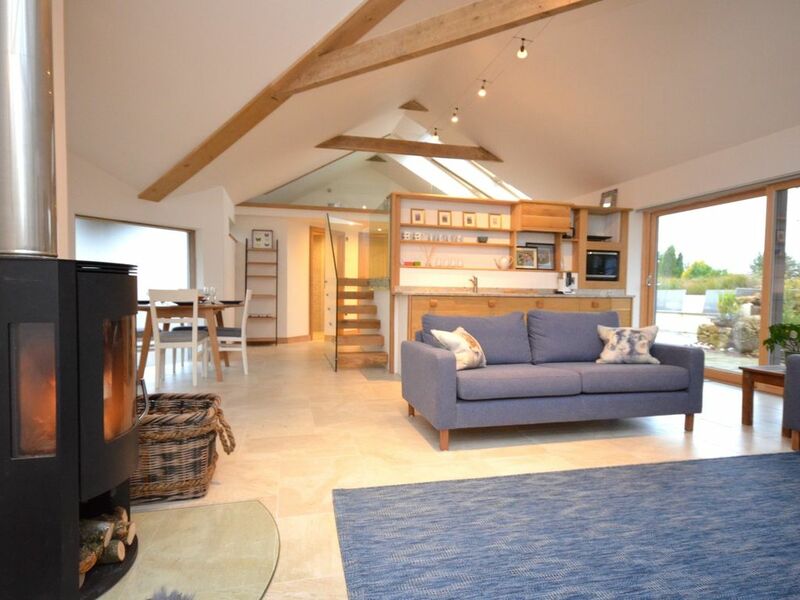 which features a Smart TV wood burner and sliding doors to outside making al fresco dining an easy option. The compact yet perfectly appointed kitchen area boasts an electric combination oven and two ring hob microwave dishwasher and fridge with ice compartment. There is a freezer and washing machine provided in a utility cupboard in the hallway. Above the lounge/kitchen/diner a lovely little mezzanine snug with views out to the west over the garden. The rest of the property comprises of the pretty bedrooms and these consist of a double and a twin both with French doors to outside and en-suite shower rooms with shower and WC. Outside of the property and to the front a lovely small patio area has been provided and this is presented with garden furniture and a charcoal BBQ. Private off-road parking for two cars is provided on the driveway. Everything very clean and new. Very comfortable beds. Good location for exploring the Bath / Bristol / Wells area.